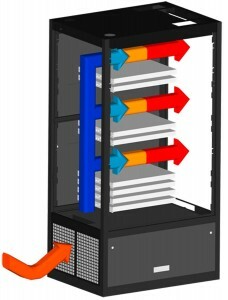 The Uptime Racks ECC13 is a self contained air conditioned computer cabinet with 13,000 Btu/hr of cooling capacity, and is the ideal cooling solution for almost any IT environment. The ECC13 efficiently cools equipment by bringing the cooling directly to the heat source, while using no additional floor space. At 115 V, the air conditioned cabinet delivers the highest cooling capacity in the industry. Additionally a simple plug-and-play installation reduces overall cost, while providing secure and reliable cooling to mission critical IT equipment. The ECC13’s breakthrough design locates the air conditioner at the bottom of the cabinet and directs cold air to the front of the cabinet ensuring valuable servers remain cool. UPTIME RACKS ECC13 employs Cold Aisle/Hot Aisle cooling techniques that world class data centers have been using for decades to efficiently cool their servers and other IT equipment. The ECC13 creates a cold blanket of air in front of the IT equipment (i.e. Cold Aisle) installed in the cabinet. It is critical to maintain low temperatures in front of the servers where they draw in air to cool down their internal circuits. The “spot cooling” in front of the servers is a highly efficient way to cool down IT equipment, as oppose to cooling down the entire room. Uptime Racks ECC13 uses standard 115 VAC, a common voltage in the United States. Therefore no special electrical requirements are necessary, or expensive electricians. It is recommended that the ECC13 operate on a dedicated 15 amp circuit. Uptime Racks ECC13 will not only reduce the temperature, but will also lower the humidity in the cabinet to an acceptable level. The ECC13 removes the moisture by using a condensate pump to deliver the condensate to a nearby drain, sink, or water line. The pump comes standard in the ECC13, and allows for continuous 24/7/365 operation without monitoring. 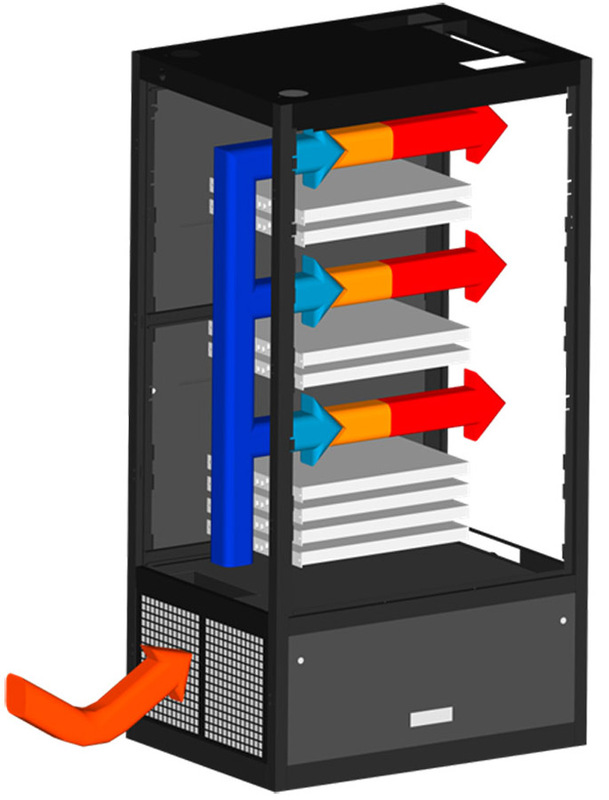 Uptime Racks ECC13 will remove the warm exhaust air from any small enclosed environment (i.e. office) through a 12” flexible duct to the drop ceiling plenum above the room.